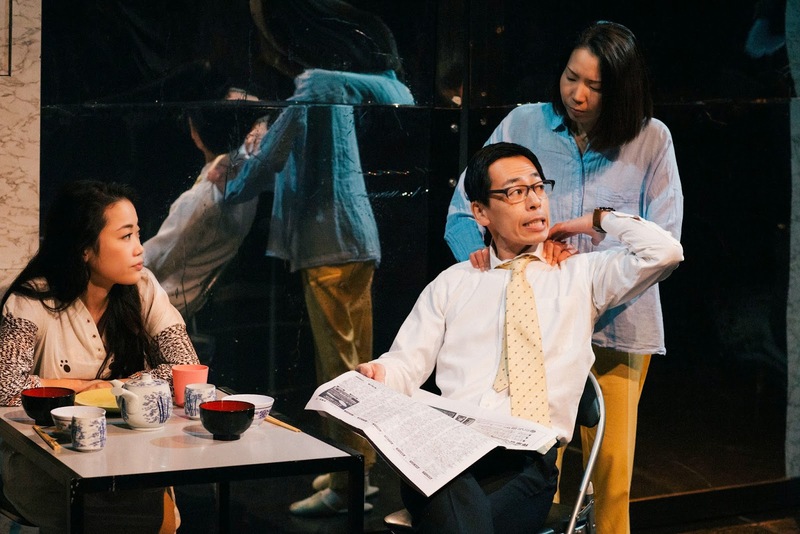 Harajuku Girls is Nicholas Goh and Papergang Theatre’s debut production. It’s written by Northern Irish/Japanese playwright Francis Turnly (currently resident writer at the Tricycle Theatre) and directed by Jude Christian (2013 winner of the National Theatre Studio Bursary). The cast is made up on an entirely East Asian cast, starring Elizabeth Tan (Coronation Street, Waterloo Road ), Haruka Abe (Cyber Bully, Cucumber) and Kunjue Li (Ripper Street, Peaky Blinders). From first glance or the manga style art on the flyers you may think this play is about fun loving fashionistas, this isn’t the case at all. We follow three girls finishing school and waiting to find out there exam results to see which University they would get into. Yumi is the young loving un-popular girl who is often insulted and shunned by Keiko the pretty and popular girl. Marie is the mediator between the both and wants them all to get on. Keiko comes from a divorced family which is rumored to have made her behavior spiral out of control and made her into the wild child she is. ‘Rumours’ is an important factor cover int eh play how society watches the youths and passes judgement. Marie is desperately trying to get into acting school but her father does not approve and refuses to pay the fees. Keiko gives her a way to make money herself through prostitution or fantasy hotels. After watching the ‘Love Hotel’ recently on tv I was very aware of these concepts and it was in fact a part of Japanese lifestyle just hidden very well. Somehow these adolescents leave there carefree lives from cosplaying and Japanese fashion at Harajuku street to club nights picking up rich old men – which Keiko does with skill, Marie does out of desperation. There is always a cut out point for Marie so she can pay for acting school and get out, Keiko has no goal this is just a means to end and being good at her job is then only thing that seems to matter. This play is a great demonstration of fringe theater actors play double roles from Marie’s father playing as a sleazy man wanting some fun with her. Yumi is also the innocent friend who later plays one of the fantasy girls in the hotel. I certainly loved all the cosplay’s used and shown from nurse uniforms to Sailor Moon inspired outfits they have kept to the roots of even using Yen as currency on stage. Also the soundtrack used for scene changes was great contemporary mix of Kyari Pamyu Pamyu and Baby Metal amongst Japanese cover songs as well. In the words of an Otaku the play develops from innocence to fan service and then feels. You couldn’t help but laugh at points and also feel deep empathy. Fantastic acting from the cast especially from Haruka Abe playing the tormented lead Marie. I thoroughly enjoyed the play and look forward to more productions from Papergang theatre. Running till 21st March – buy tickets here. SING FOR YOUR LIFE – Taxidermy puppets dancing ? !